The totals — and hundreds of dumplings — go down as Matt Stonie wins neck-and-neck battle with Joey Chestnut at Nisei Week contest. For Matt “The Megatoad” Stonie, a competitive eater who has already established himself as a hot dog hero and a taco titan, last Saturday marked another triumph as he reclaimed his title at the Day-Lee Foods World Gyoza Eating Championship, held at the JACCC Plaza in Little Tokyo as part of the Nisei Week Japanese Festival. The margin of victory — a mere four gyoza. 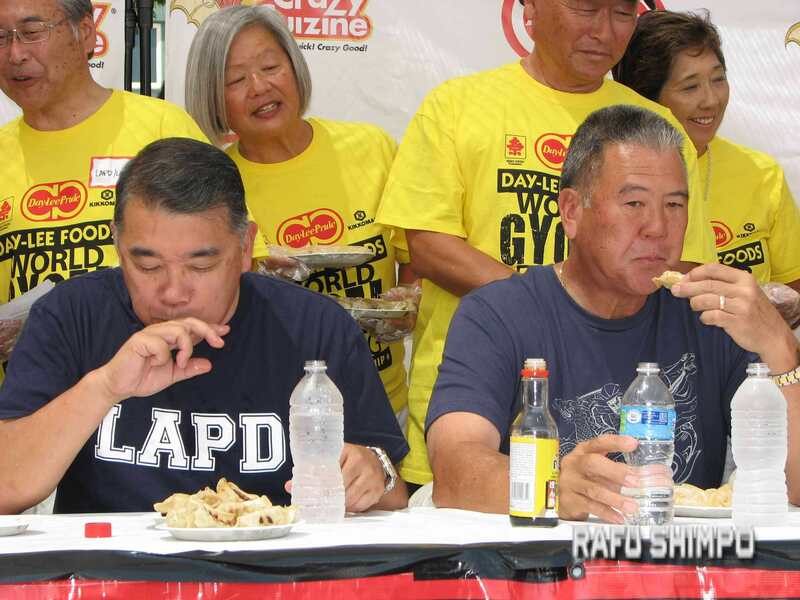 Though he did not surpass the 377 gyoza he consumed last year, the 23-year-old Nikkei from San Jose beat his closest rival, fellow San Josean Joey “Jaws” Chestnut, with 343 in 10 minutes. Chestnut, 31, who topped Stonie with 384 last year, was runner-up this time with 339. In 2013, Stonie bested Chestnut, 268 to 251. Describing the Stonie-Chestnut rivalry as a battle “between age and youth, between experience and vigor,” emcee Sam Barclay declared, “They tower above all others … but there can be just one champion here today.” The crowd cheered when the results were announced. “I’m full, obviously, a little winded, but winning always feels good,” Stonie commented after the competition. Stonie achieved the No. 1 ranking in Major League Eating with a win over Chestnut in the July 4 Nathan’s Famous hot dog eating contest in Coney Island, 62 to 60. On July 17, about 100 people held an impromptu parade in his honor on San Pedro Street in downtown San Jose as Stonie carried his mustard-colored title belt. “A small group of people got together just to cheer me on, so that was fun,” Stonie recalled. When he walks around San Jose, “I get recognized every once in a while by people who have watched the Fourth of July contest on YouTube,” he noted. And on Aug. 15, Stonie was on his home turf when he successfully defended his title on Aug. 15 at Chacho’s Taco Festival in San Jose’s St. James Park, downing 103 tacos in eight minutes. A nutrition major at Mission College in Santa Clara, Stonie also set the following records this year: 182 slices of bacon in five minutes; Iguana’s Burritozilla (5 pounds) in one minute, 50 seconds; 34 pepperoni rolls in 10 minutes; 15 pork rolls (7.5 pounds) in 10 minutes; and 241 Hooters chicken wings in 10 minutes. 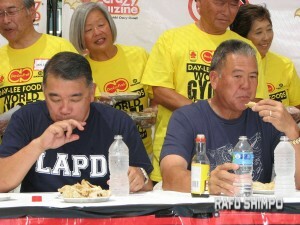 Miki Sudo of Las Vegas again placed third in the gyoza contest with 178, down from 199 last year. Sudo appeared to reach a breaking point at around six minutes into the competition, and seemed to be resigned to reaching below her personal best. 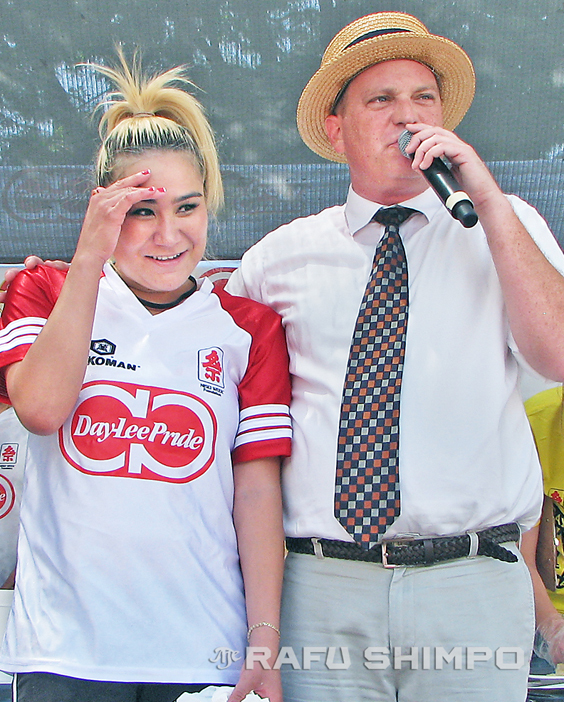 Stonie received $2,000 and a trophy — a figure of a man holding up a giant gyoza — presented by Jason Uno of Day-Lee Foods. 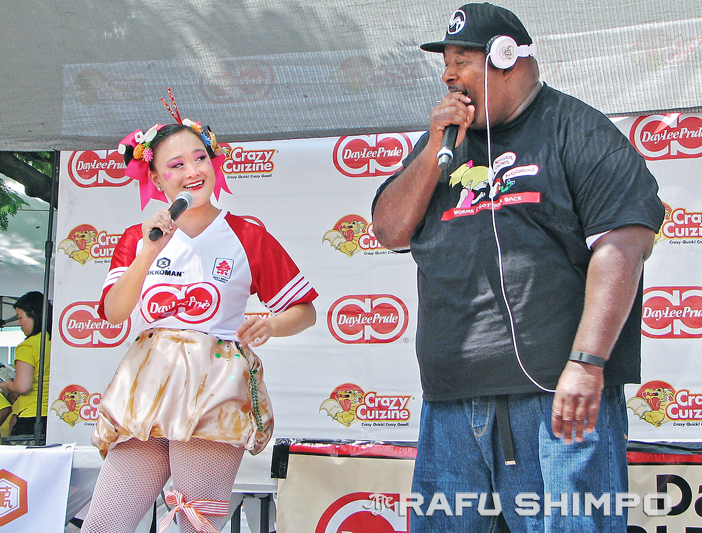 2015 Nisei Week Queen Sarah Hutter presented Stonie with a Day-Lee Foods happi coat. The rest of the $6,000 purse was distributed to the other top 10 finishers. Stonie and Chestnut have dominated the competitive eating circuit for the past few years, and Stonie offered a little good-natured stoking of the fire after Saturday’s event, taking note of the age difference. 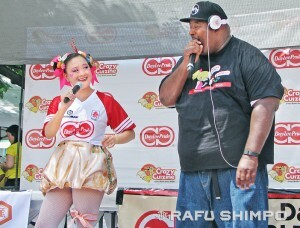 Booker also provided some pre-competition entertainment by rapping about gyoza. The LeFevres are a married couple who are competitive eating pioneers. Barclay asked them about their secret to a long and happy marriage. “We get along well, we’re good friends and we have the same interests,” said Rich. “We love the same things … We love to compete. We love everything the same. It’s almost like we’re from the same family … and he does give me my way quite a bit,” said Carlene. The tables were stocked with Kikkoman ponzu sauce, and the competitors could wash the gyoza down with the beverage of their choice. The main competition was preceded by two amateur events. 2014 Nisei Week President Okamoto and the 2014 Nisei Week Court — Queen Tori Nishinaka-Leon, First Princess Lindsey Sugimoto, Miss Tomodachi Ashley Arikawa, Princess Tiffany Hashimoto, Princess Melissa Kozono and Princess Dominique Mashburn — ate a combined total of 88 gyoza in two minutes (an average of 12.5 per person). Then teams of six members each from the Los Angeles Police Department and Los Angeles Fire Department — led by former Deputy Chief Terry Hara and former Deputy Chief David Yamahata, respectively — faced off. After three minutes, the LAFD earned bragging rights with a total of 154 to the LAPD’s 142. 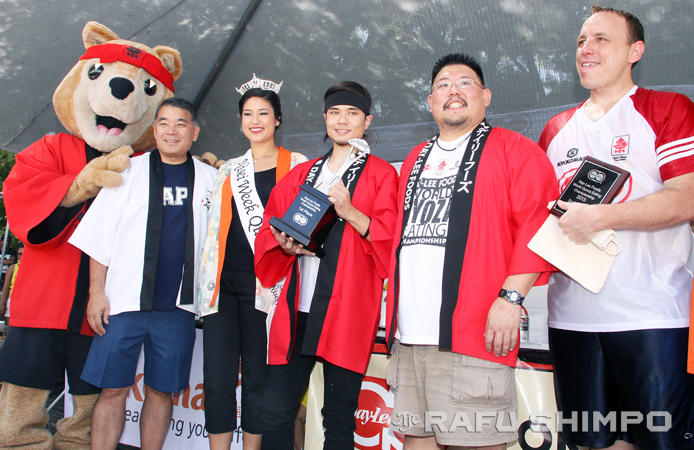 The 2015 Nisei Week Court helped the volunteers during the main competition and will get their opportunity to wolf down plates of gyoza next year. They will be joined by Hara, this year’s festival president. This event was sanctioned by Major League Eating and the International Federation of Competitive Eating – as is the July 4 Nathan’s Hot Dog contest – and the kings (and queen) of the hill in Coney Island reigned supreme again in Little Tokyo. And that’s saying quite a mouthful. – Rafu sports editor Mikey Hirano Culross contributed to this report.